JEGS Rooftop Cargo Carrier 18 cu. ft.
JEGS 90097 - Rooftop Cargo Carrier 9 cu. ft. Need extra storage space for your next trip? 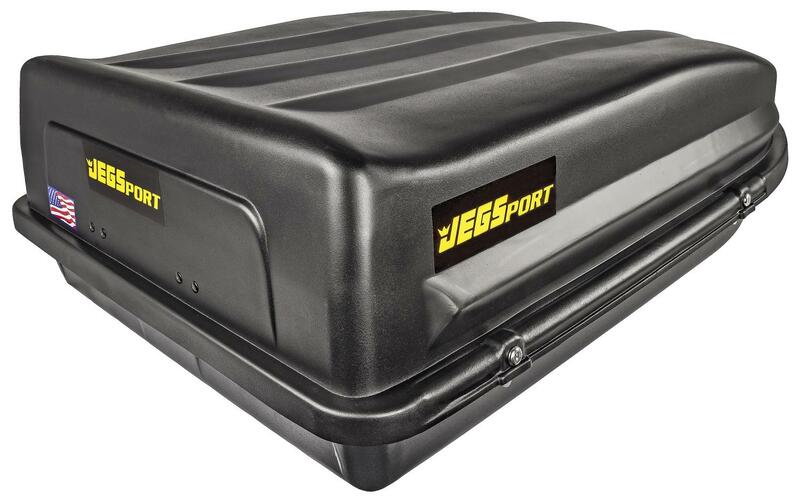 JEGS Rooftop Cargo Carriers deliver so much storage space it’s like having an extra trunk. Manufactured from durable high-density polyethylene with an added UV inhibitor to protect against cracking and fading through all four seasons. The aerodynamic design minimizes wind resistance maximizing fuel efficiency. Top quality bale latches ensure a weather-tight seal. The convenient entry provides easy access while covered keyway locks to provide extra security for your things. Zero tools, simple assembly, and easy installation allow for smooth travel and no-sweat storage. Mounting hardware and instructions are included. JEGS Rooftop Cargo Carriers come with a limited lifetime guarantee. Assembles in 5 minutes - NO Tool Assembly! Easy access side opening on 9 cu ft. & 3-side opening on 18 cu ft.
100 lbs. load rating on 9 cu ft. & 110 lbs. load rating on 18 cu ft.
90098 - JEGS Rooftop Cargo Carriers is rated 4.6 out of 5 by 72. Rated 5 out of 5 by Jimmyp80 from Great price With free shipping this is the same quality at other places I looked. Rated 5 out of 5 by Anonymous from Great carrier Bought it for 1200 mile trip and worked great and was quiet , even in high winds it done fine , it had bout 80-120 lbs of stuff in it , it is a very good luggage carrier and great value! Rated 5 out of 5 by NJHammer from Awesome c luggage carrier. Jeggs staff were very friendly and helpful. Came in on time. Fee days. Undamaged. Installed in 20 mins. Easy EASYYYYY directions. Seems very sturdy. Just the right price. Actually you can't get a better value. Light Enough that I installed by myslef! Rated 5 out of 5 by Happy Climber from Fast shipping! Great, affordable product! My carrier arrived in 3 days, in a giant cardboard box! It came with everything needed for assembly and mounting. This cargo carrier does the job at a fraction of the cost of big name brands. It’s not carbon fiber or Kevlar, and it probably won’t last forever, but it’s definitely adequate. I could see it through the sunroof of my Avalanche, and it shuddered a tiny bit at 80 mph, but it stayed put at that speed and held together just fine. It does flex and bend, so loading needs to be fairly precise in order for the lid to line up with the base. It worked great with my Avalanche. I just stood on the tuneau to load and unload the carrier. I’ve only used it once, so I don’t know how many uses we’ll get before it wears out, but at this price, I’ll be happy with 5-10 trips. Rated 5 out of 5 by sportscenterisnext from Great Carrier After exhaustive research trying to locate a rooftop cargo carrier in my area to no either re-sale or new to no avail, I called JEGS. Glad I did! The customer service representative was outstanding, knew everything about the item, answered all my questions. Biggest concern time frame for delivery as I was moving, because of the size of this item it would travel as freight, the CSR assured me delivery in 3 days or less from Ohio to Arizona, they nailed it. Upon opening the shipping container and looking at the unit itself it's large and well made, assembly took 2 minutes, easy to follow instructions. Mounting to the luggage rack of my 2003 Mazda Tribute took maybe 8 minutes - no issues. After a 6 plus hour drive into Colorado no issues with the unit moving, noise or resistance from wind, I doubt it made any difference in my gas mileage. After 3 weeks in Colorado items in carrier are, safe, sound and dry. Rated 5 out of 5 by Mike from MD from Fast Shipping, Great Price, Decent Quality It worked out extremely well for a week-long trip to the beach. We ordered it right before we left and it got here with plenty of time to spare. It only took like 2 days. I was astonished at the shipping speed for such a large item. The item quality is pretty decent for the price. It's not a tank, but more than substantial enough to hold your stuff for the drive and keep it dry. It was so nice having all the extra room. Normally we're packed in like sardines - not this time. We're extremely satisfied with our purchase. Rated 5 out of 5 by Frankie the Fink from Nice inexpensive carrier - works great w/ upgrades Bought this a month back and have now driven 900 miles with it -- it doesn't leak one little bit. Do yourself a favor - buy 6 Ace Hardware small caribiners and drill two more holes in the hinge and install them per photo, then use the rest to replace the tiny clips for the outside fasteners. If you don't want to deal with the prop rods - spend about $20 for the SportTrak Car Carrier round spring hinges and install them - no need for the prop rods then...the lid just snaps open and stays open. Will this fit my 2013 Subaru Forester? Will this fit on a 2017 Subaru Forrester? Would you recomm nd this or a 9 cubic foot carrier? The 9 cubic foot carrier is probably a better choice for the Forrester. Would this fit a 2018 Chevy Equinox with factory roof rails? Yes, this will fit your Chevy Equinox. Will this fit a 2005 Pontiac Vibe? Concerned about antenna at back of car and operation of liftgate (hatchback). Will this fit my 2007 Honda Pilot EXL? Yes, this will work on the Honda Pilot. will this fit 2018 Ford Escape with crossbars? Yes, this will fit your Subaru. Will this fit my 05' toyota highlander? Yes, this will fit your Toyota as long as as you have the proper cross rails installed.